With J in Chicago, I was on my own for dinner. My plan for the evening was to pick up a movie from Redbox and grab a pizza then just relax in my basement all night. So the question is, where to get a pizza from. There are still a few places in the Kalamazoo area that I haven’t tried yet and I wanted to try one of those. The place I chose was Bruno’s Pizza & Restaurant on West Michigan Avenue right across the street from Western Michigan University. I’ve been wanting to go there for a while, but I never know when they’re open. They don’t have a website and any information I can find online always seems to contradict information I’ve found on different websites. I figured being a Friday night, they would be open. I wasn’t really sure about what they had on the menu because I have no idea how old the menu I found online really is. Again, with no website, it’s hard to really know what a place has. I figured I was pretty safe ordering a large pizza with pepperoni and bacon. They lady on the other end said it would be about twenty minutes which was just enough time for me to get my movie then drive over to campus to pick it up. 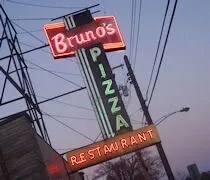 The first thing you notice about Bruno’s is the great neon sign that hangs from the building. I can’t believe I’ve never noticed it before, but I really don’t go that way very often. The next cool feature is along the side of the building. There’s a painted advertisement on the west side of the building in the alley between Bruno’s and FedEx. There isn’t much parking but I was able to find a street spot around the corner on Burrows Road and walk back. Inside, the store looks like it hasn’t changed much since it opened. The place has a really old, yet strangely comforting feel to it. 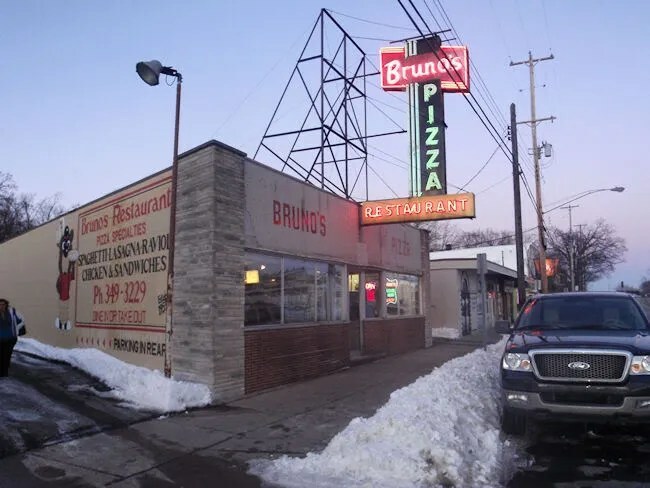 Bruno’s isn’t a fancy place, but it has the feeling of a place that has been around long enough that you know you’re going to get a good meal. 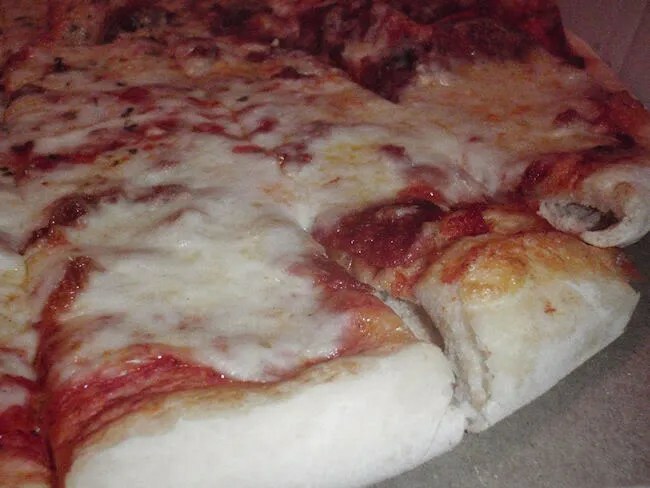 When I got home, I opened up the pizza to find a pizza that looked, well, like a pizza. It didn’t look like anything special, but looks aren’t everything. I picked up the pizza and was surprised to find a pretty crispy crust. I don’t like soggy crusts, so the crunch I got when I bit into it was a welcome sound. The pizza was cut in to strips which is an interesting choice and one I hadn’t seen before. The strips were more manageable than the traditional triangles and it’s one of those things that can really make a place stand out. 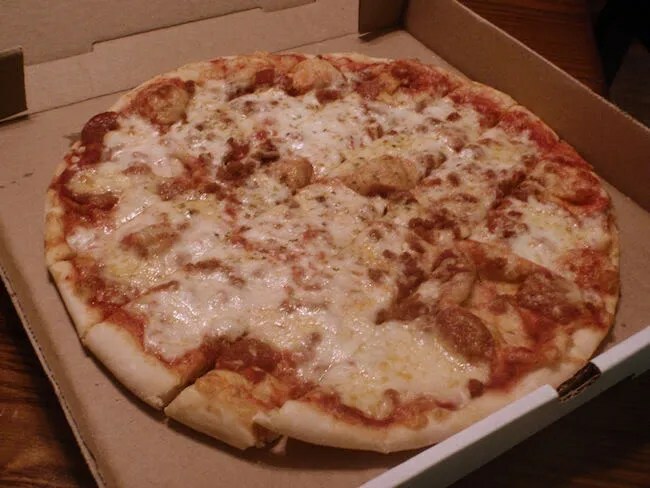 The pizza turned out to be really good and I had to force myself to stop so I would have lunch the next day. I had no idea what to expect from Bruno’s. The reviews I read were so mixed it kind of scared me a little. I really wanted to like the place and I can honestly say I did. What really stood out to me was the charm of the restaurant. Even though I didn’t dine in, I just got a really good vibe from the place.